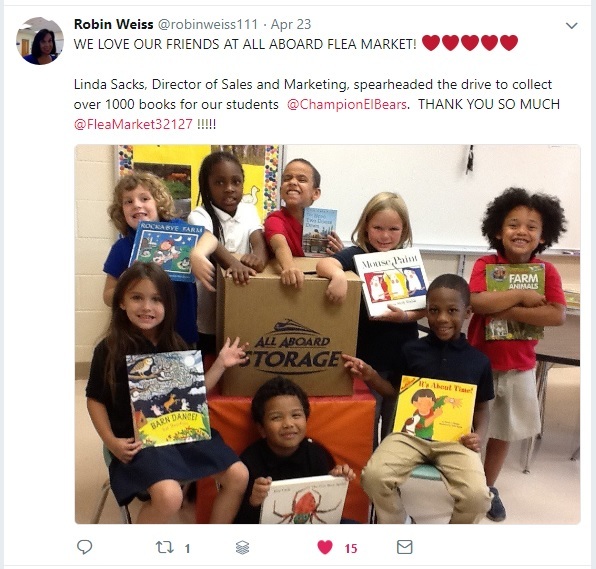 Our Director of Sales & Marketing for the All Aboard Flea & Farmer’s Market, Linda Sacks, recently spearheaded a campaign to have books donated to the children at Champion Elementary School in Daytona Beach. The year-long book drive ended and the results were amazing! 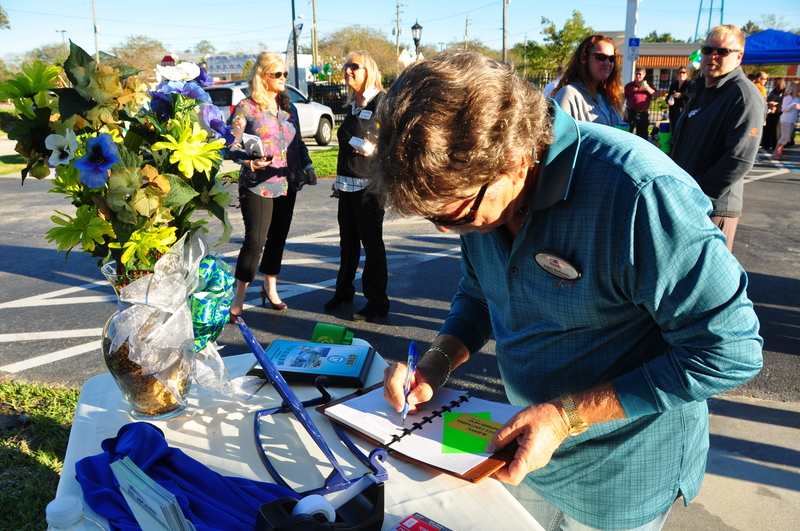 1,068 books were collected and donated. 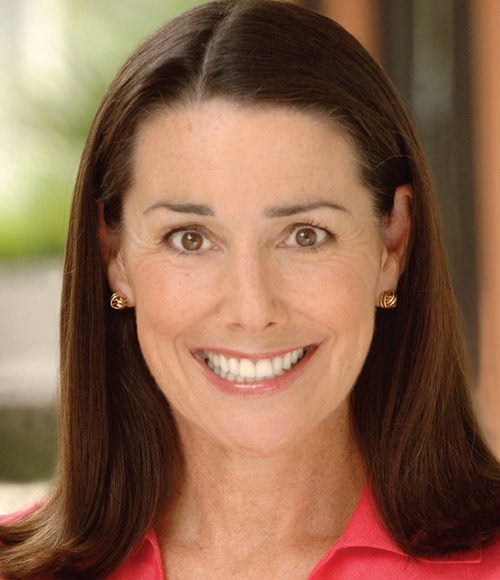 We are so happy to have Linda on our team. 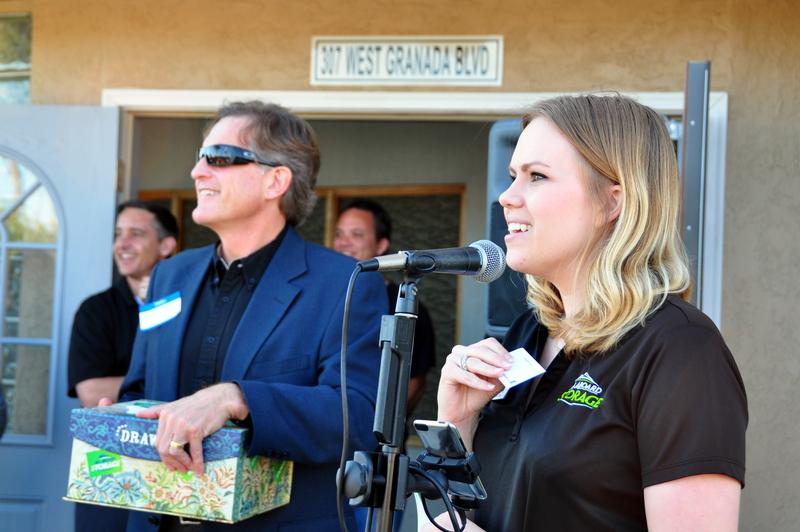 She is spreading happiness, knowledge, and making a difference in our local community. 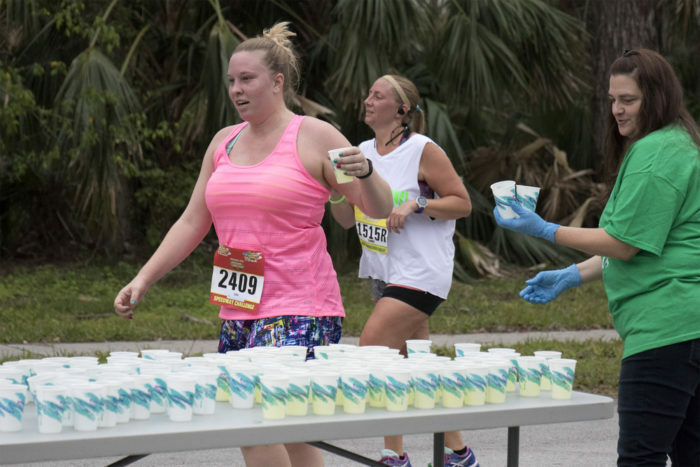 Good job Linda! She wants to give her thanks to all of the vendors, shoppers, and Historical Treasures for donating all of these books and making this happen. 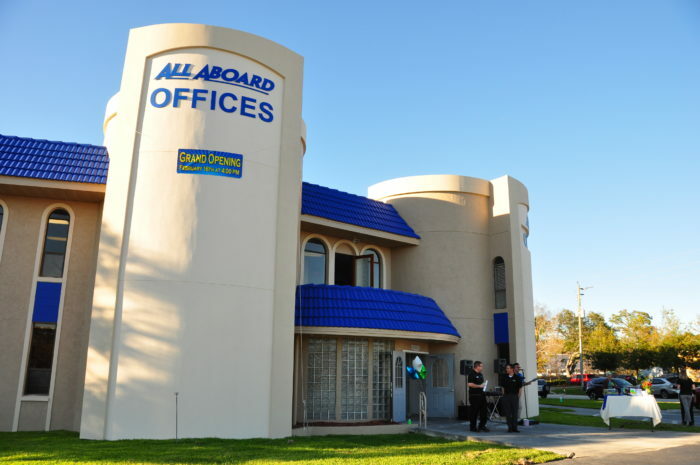 Give her a call at 386-523-3579, visit her in person at All Aboard Market, & be sure to “Like” our page on Facebook to follow updates! 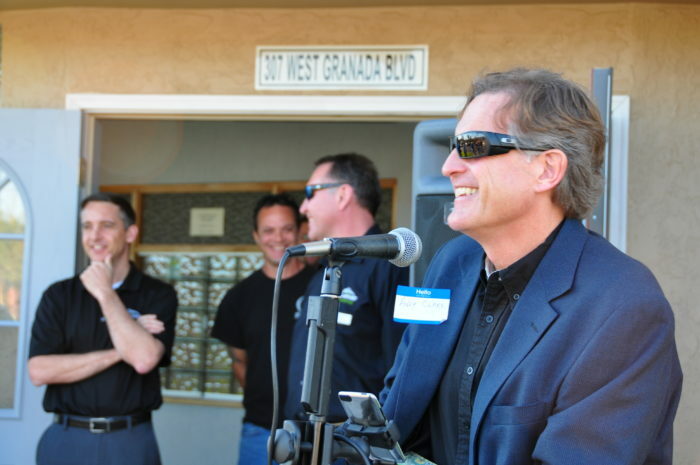 Grand Opening for All Aboard Storage – Granada Depot! 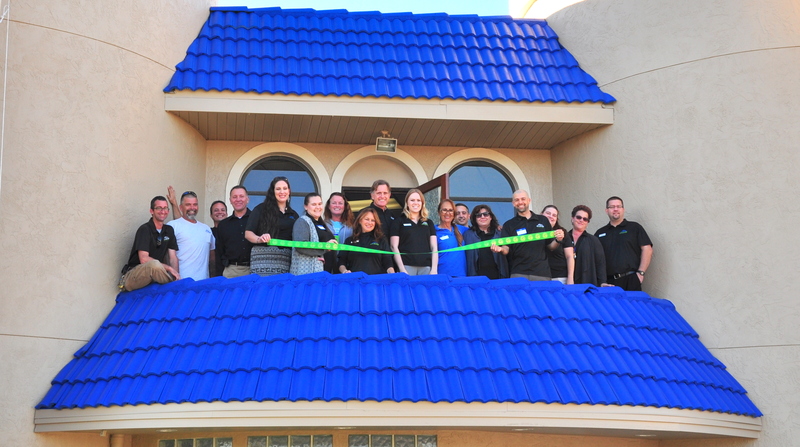 Our newest All Aboard Storage location has officially opened its doors in Ormond Beach, FL! We threw a party that included a ribbon cutting with the Ormond Chamber, live music, food, and made memories with friends new and old. 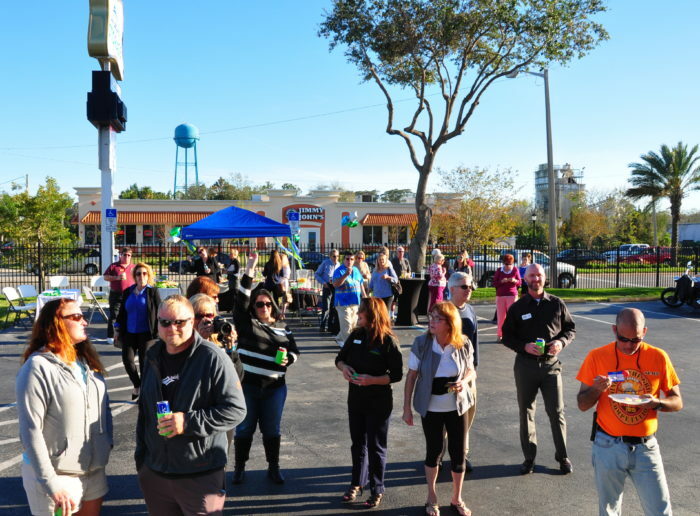 We had a crowd of people show up that included vendors, employees, friends and family who toured the storage facility and the nearby All Aboard Offices. The Granada location has climate-controlled self storage units as well as office space in the neighboring All Aboard Offices building. Check out some of the photos we took at the event! 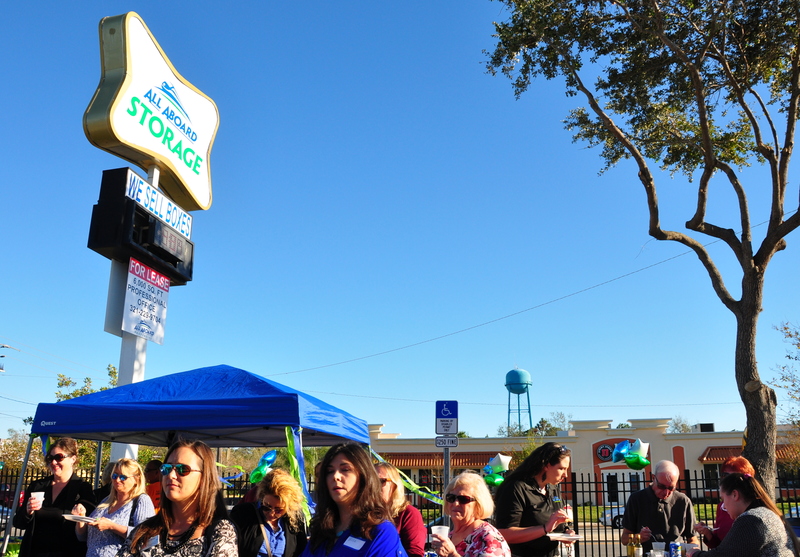 Stop by for a tour of our new local self storage facility! We’d love to have you. 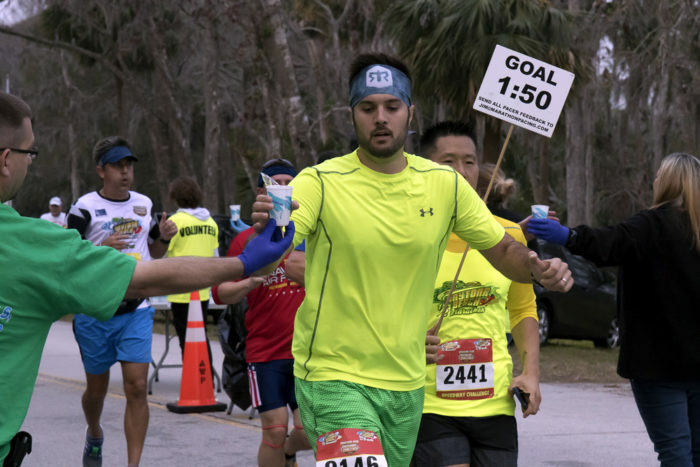 Races draw a lot of people with the excitement of competition and the camaraderie of participating in something big. 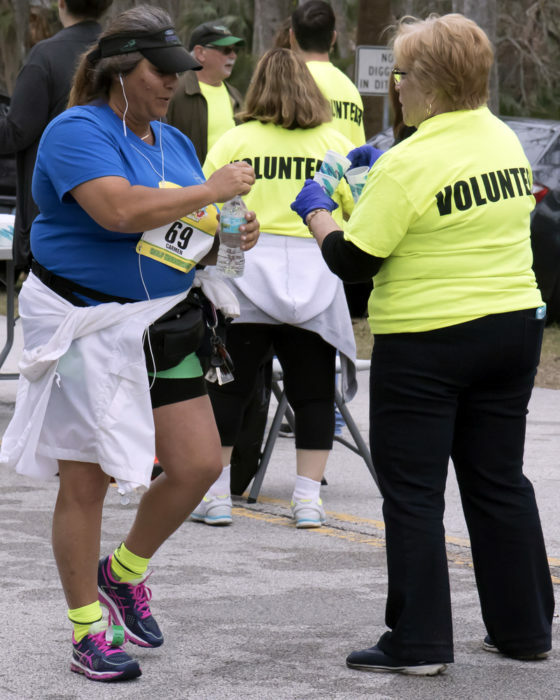 Not only do the runners get the feeling of being part of something special, the volunteers do as well! 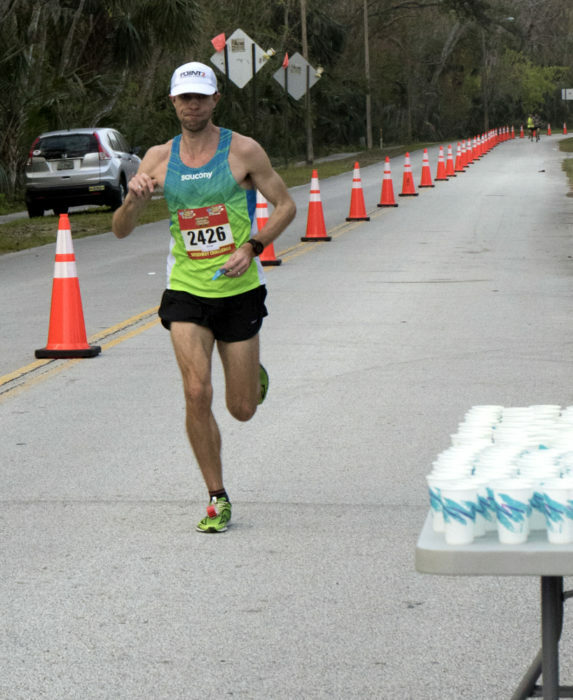 This was the feeling this past weekend on Sunday, Feb. 5th 2017. 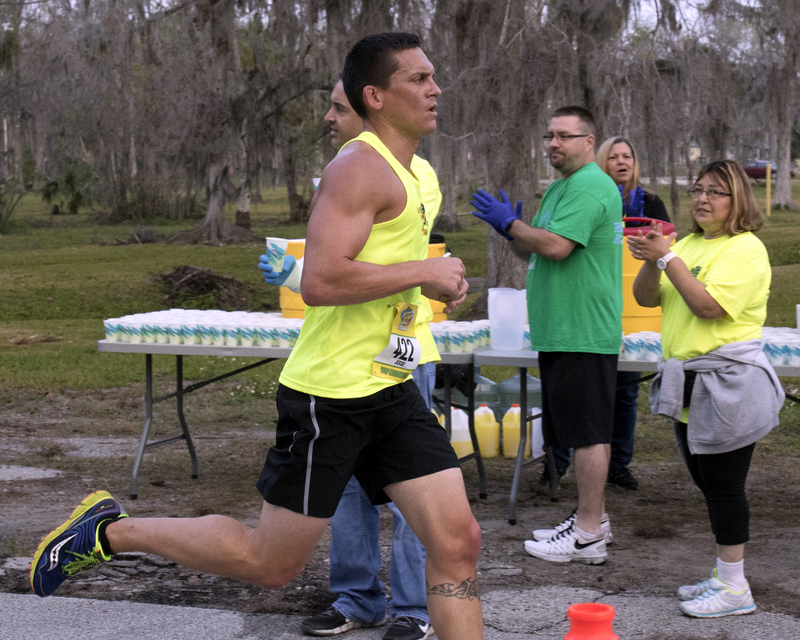 More than 2,980 people participated in a half marathon, relay, and a 5K. The race was held at the Daytona Beach International Speedway called the Daytona Beach Half Marathon. 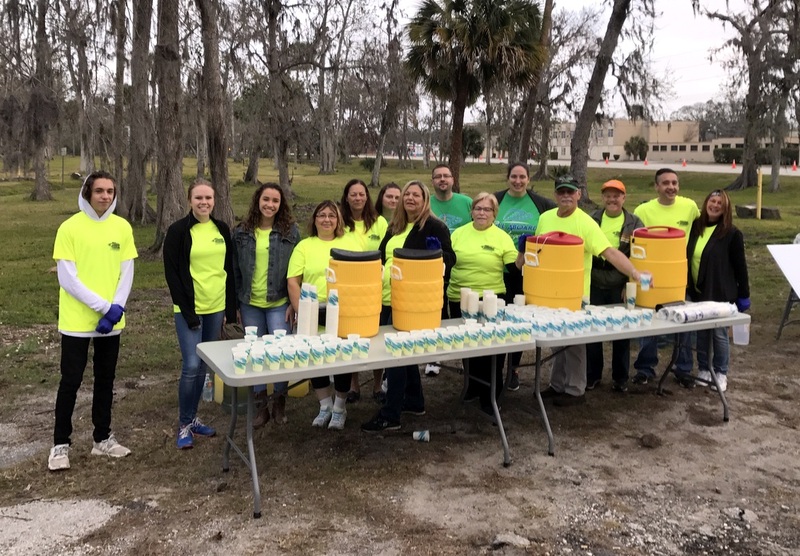 Several of our employees at All Aboard Storage & All Aboard Properties signed up to volunteer to hand out water to the thirsty runners. 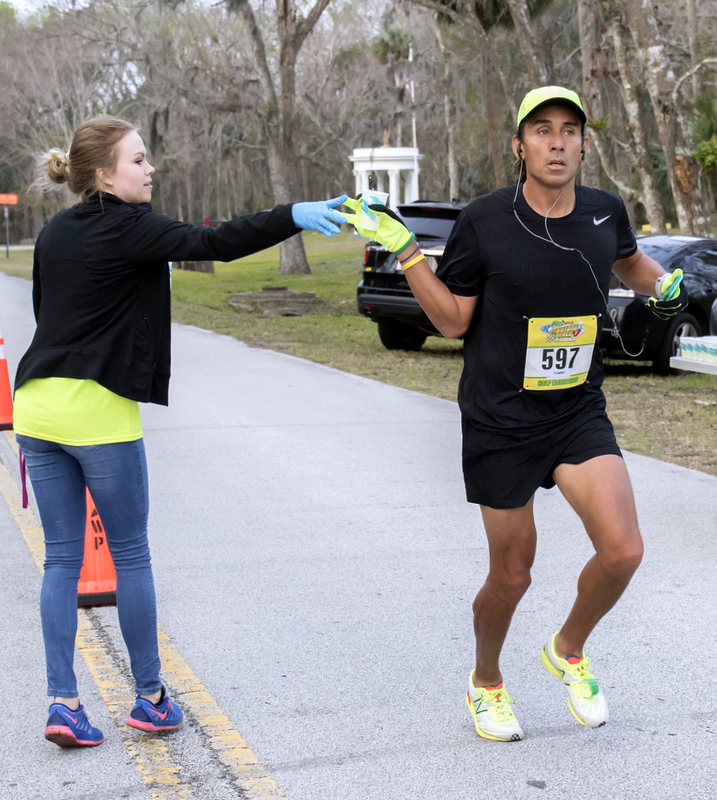 The morning was chilly, but that didn’t stop us! 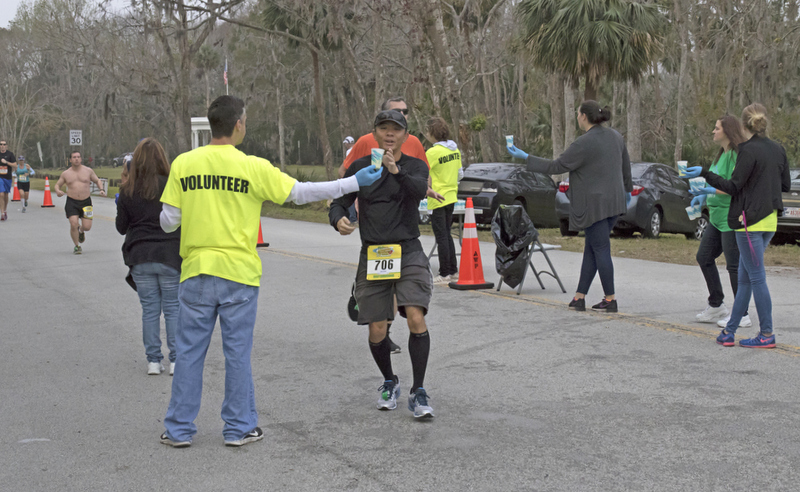 Here’s some highlights from the events below! All Aboard Properties is excited to announce we have a winner for the 2016 All Aboard Entrepreneurship Grant! 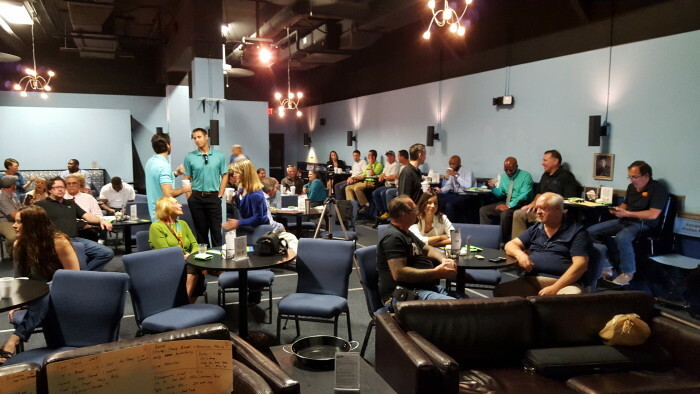 Back in April, we held a contest seeking promising entrepreneurs to award 12 months of free rent at one of our properties up to a $15,000 value. 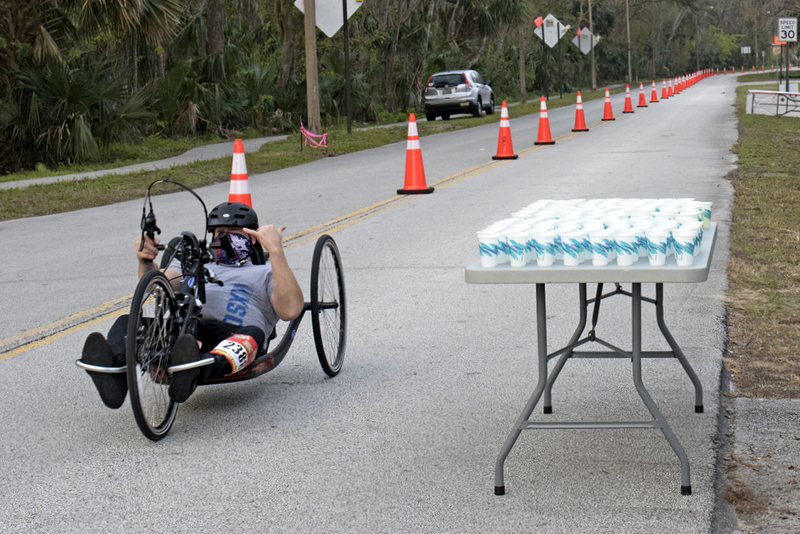 We received 37 applications of which 10 were selected to submit a final video application. 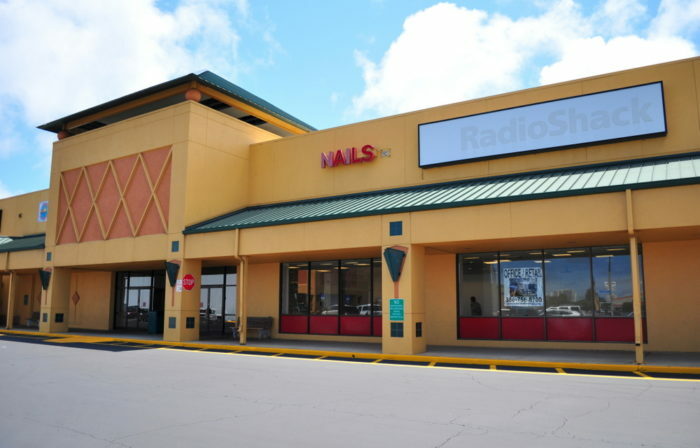 Corrine Heck of Details Flowers has been awarded the grant and is setting up shop in the Sunshine Park Mall in South Daytona with the help of All Aboard Properties. Her software business, Details Flowers, connects & organizes top florists & wholesalers throughout the United States & Canada. Details Flowers disruptive software offers benefits in real-time data exchange, sales forecasting and sales of flowers. 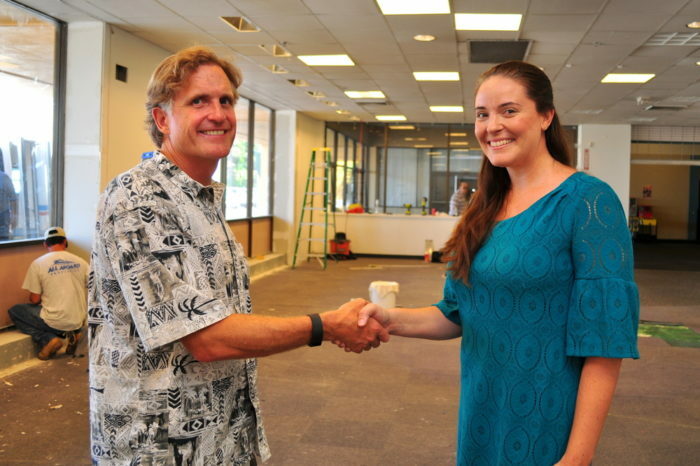 Corrine is also working with Andy Clark, CEO of All Aboard Properties & All Aboard Storage, in starting a creative coworking environment called “The Greenhouse” also located in the Sunshine Park Mall which will help entrepreneurs start and grow their fledgling businesses. 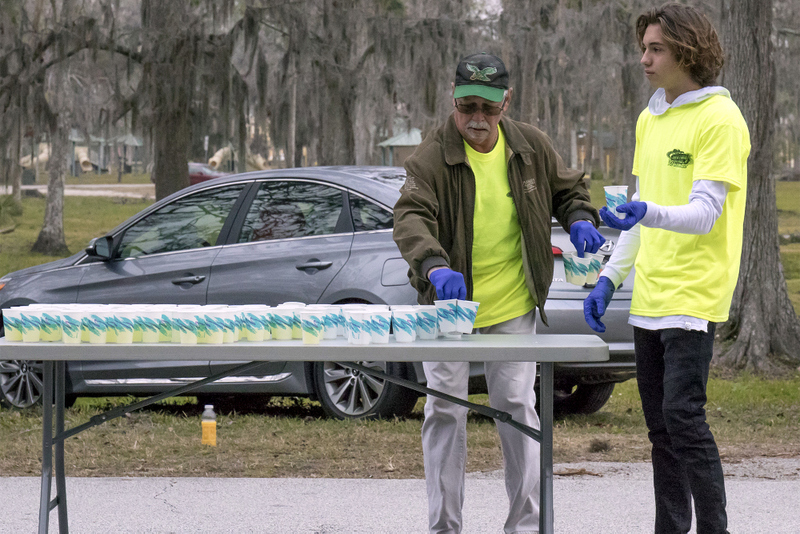 We’re so happy to have the opportunity to support entrepreneurs in Volusia County and will remain involved in our community. Thank you so much to all who applied! In the past month a few of our employees have made it in the local newspaper! 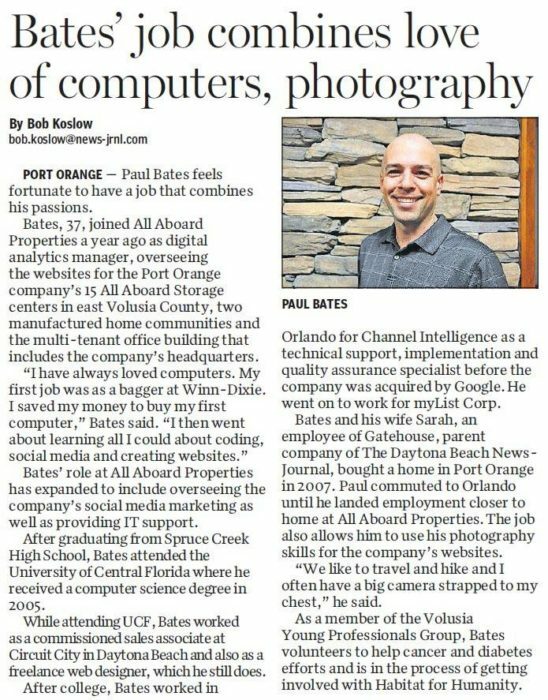 We’re proud to announce that Paul Bates, our Digital Analytics Manager for All Aboard Properties, made the news for being a Daytona Beach News-Journal’s 40 Under 40 Honoree! 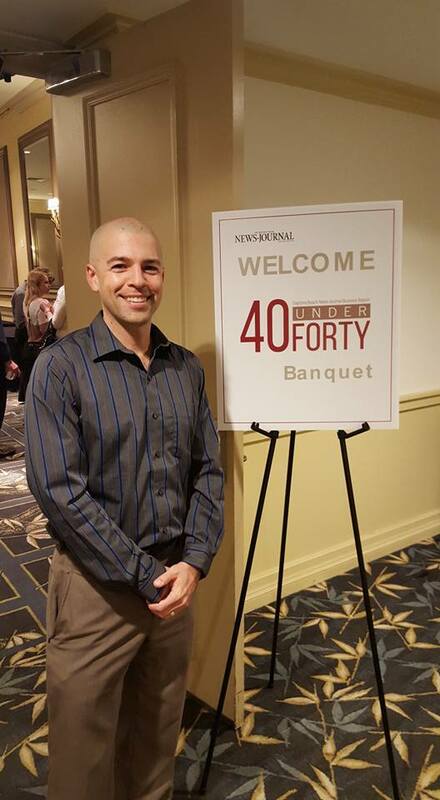 The banquet honoring all 40 Under 40 honorees was held at The Shores Resort in Daytona Beach Shores where CEO Andy Clark attended in support of Paul. 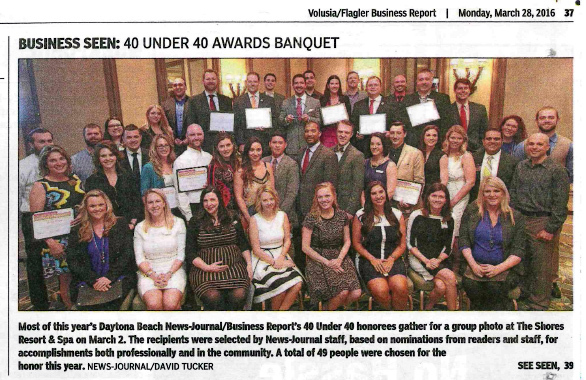 The 40 Under 40 honor is a selection by the staff at Daytona Beach News-Journal for 40 people under the age of 40 years old for their accomplishments professionally and in the community based on nominations from readers and staff. 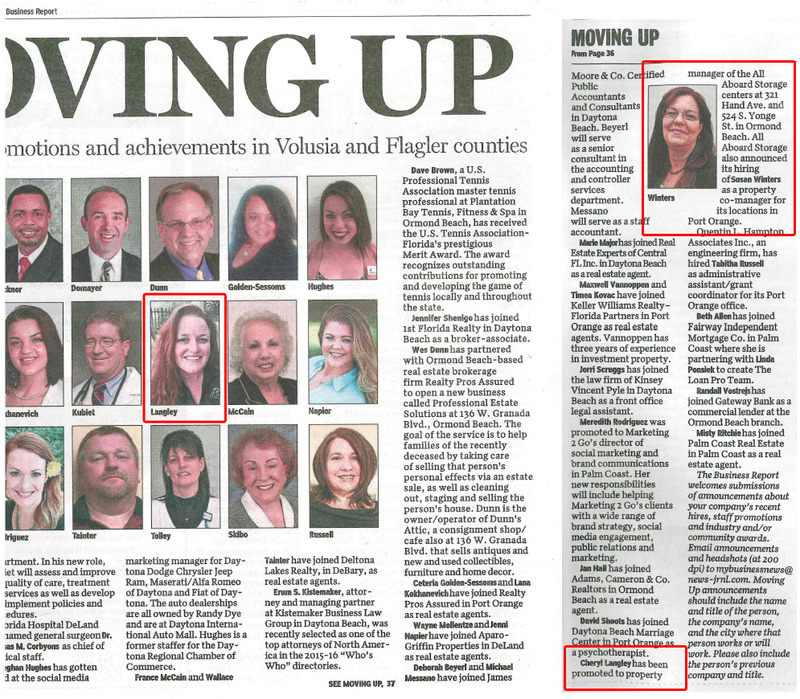 Also in the news recently were two employees including Cheryl Langley who recently received a promotion to Property Manager of All Aboard Storage Ormond Depot and the announcement of our new hire Susan Winters as a Property Co-Manager. We strive to create a feeling of giving back in our employees by encouraging community service and holding events such as our Feeding Children Everywhere. Having employees that want to make their community a better place to live is a high priority to us, because employees that care about their job, care about our customers. 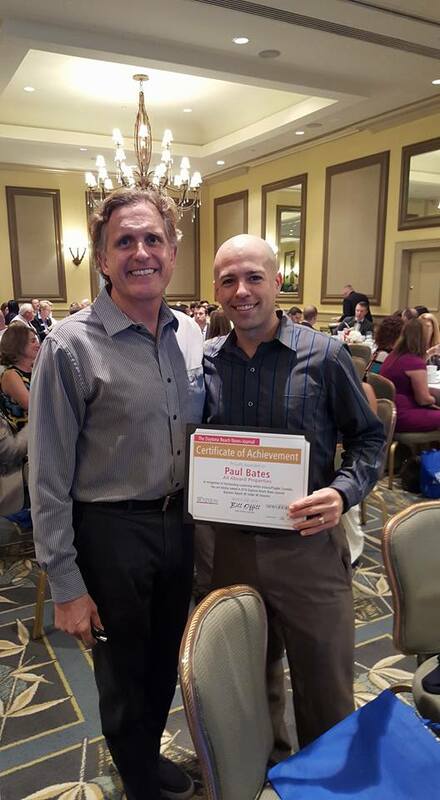 Again, congratulations to our employees and we look forward to many more announcements like this! 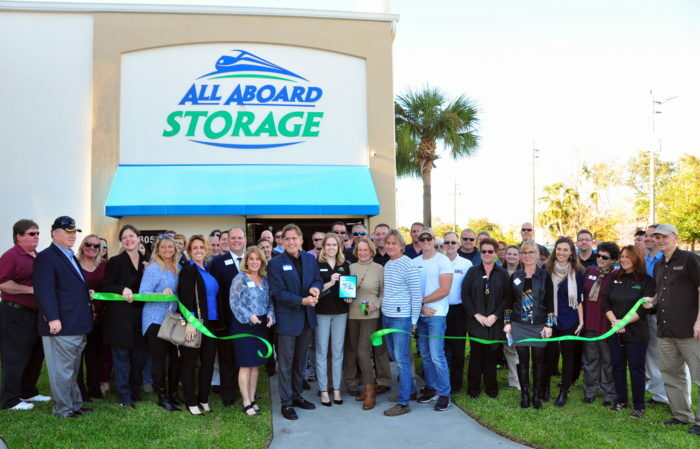 Port Orange, FL – Local family-owned company, All Aboard Storage that specializes in self-storage in the Daytona Beach area, has once again pushed the limits of what was thought possible in self-storage industry with new plans on the microscale – miniature storage. If memory serves, last year All Aboard Storage broadened their horizons with the “Lunar Self-Storage Initiative” to complete construction of their storage units on the moon. Where are people going turn when they need to safely and securely store these nano-assets they’re using for work and play? 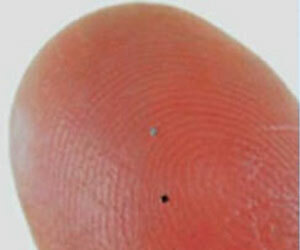 People are already beginning to cry out for a place to put these valuables that include specialized robots, vehicles, tools, and now micro-toys whose equivalents are the boats & RVs in our macro world. While they aren’t releasing details on how storage auctions will work on the micro-scale, inside sources revealed the possibility of pocket units you could theoretically carry with you wherever you go. Our CEO, Andy Clark, recently presented at 1 Million Cups Daytona on the topic “Company History & Overcoming Adversity”. Several entrepreneurs, community leaders, and even quite a few All Aboard Properties employees attended the presentation held at Cinematique Theatre off of Beach St. in Downtown Daytona. 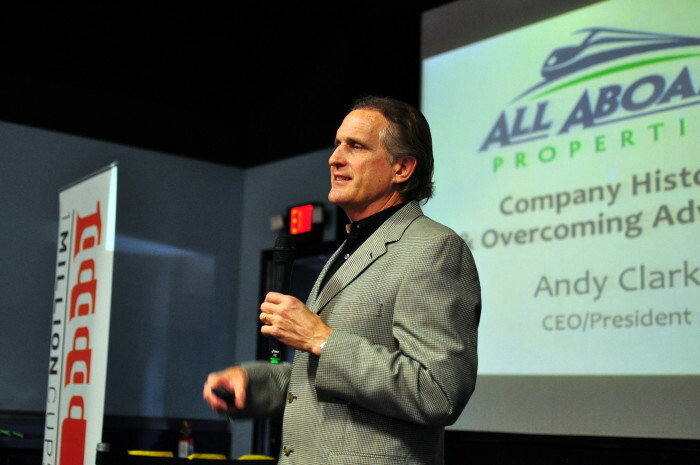 So what goes into building a lasting company? Some businesses start with an idea from one person. 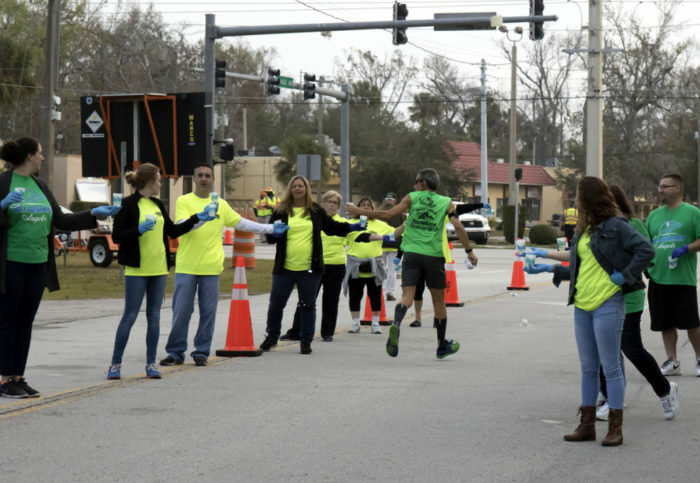 Others might start off with a group of people coming together with a common goal. 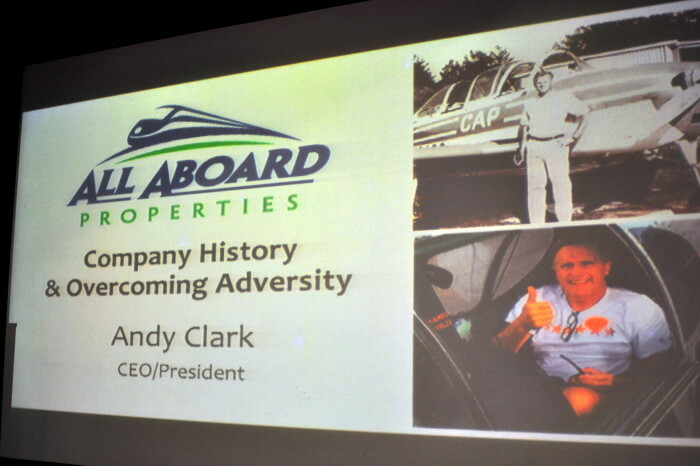 In our case, All Aboard Properties began as Clark Properties in 1952 from the hard work and dedication of Douglas Clark, who began building houses in Illinois, and then moved down to Florida, bringing with him the passion to keep building properties. The family business began to slowly grow over the decades and continues to this day as a family business with Doug’s son, Andy Clark, at the helm and continuing to grow the company. 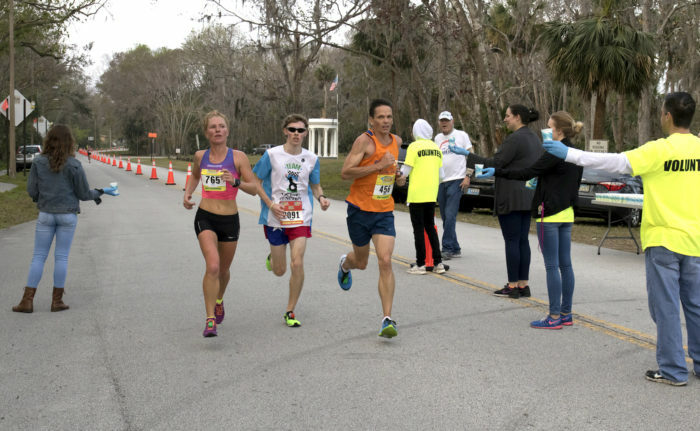 Much of the Port Orange area would probably look very different if the Clark family had not moved down and gotten involved in real estate. 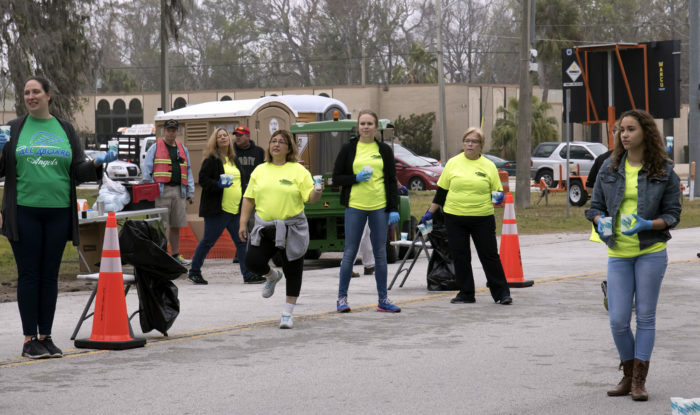 It’s only natural that when you live in an area, you want to improve that area and make it nice for you and everyone else living in that area. 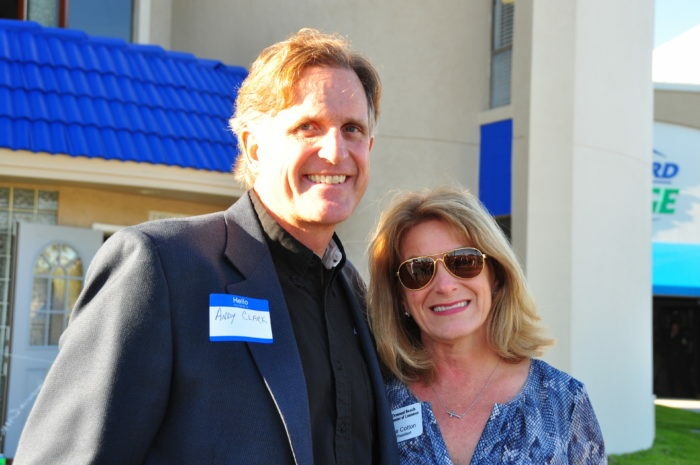 All Aboard Storage started becoming the company’s focus in the late 1970’s and early 1980’s and is now the main driver of the company with a goal of opening 1 new local storage facility a year. Being an entrepreneur and building a business (even a family business) is not always an easy thing and comes with ups and downs. 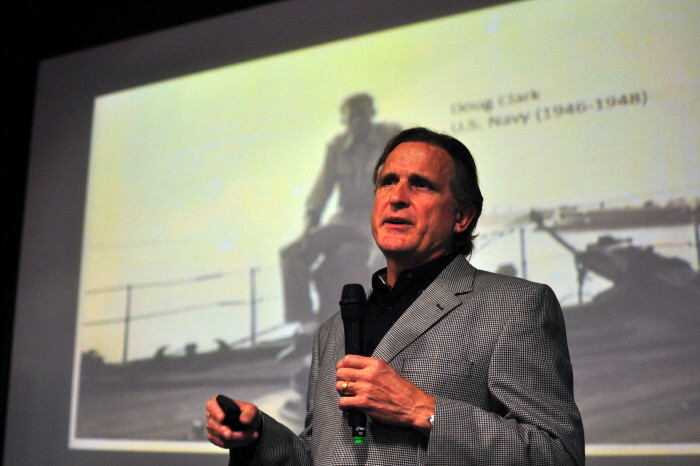 Some things that make Andy Clark’s story different and compelling is the plane crash that changed their lives, the death of his father in 2009, and the painful recession that all happened at the same time. Our CEO, Andy Clark, was in the Sunday edition of the Daytona Beach News-Journal with a large article right on the front page of the business section! 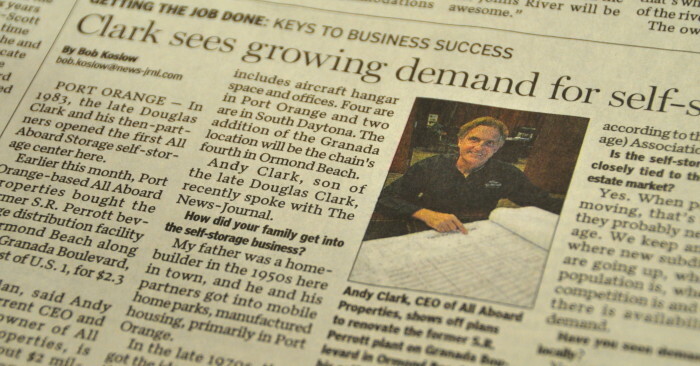 The tagline reads “Getting the job done: Keys to business success” and a title of “Clark sees growing demand for self-storage centers”. The article talks briefly about the purchase of the S.R. 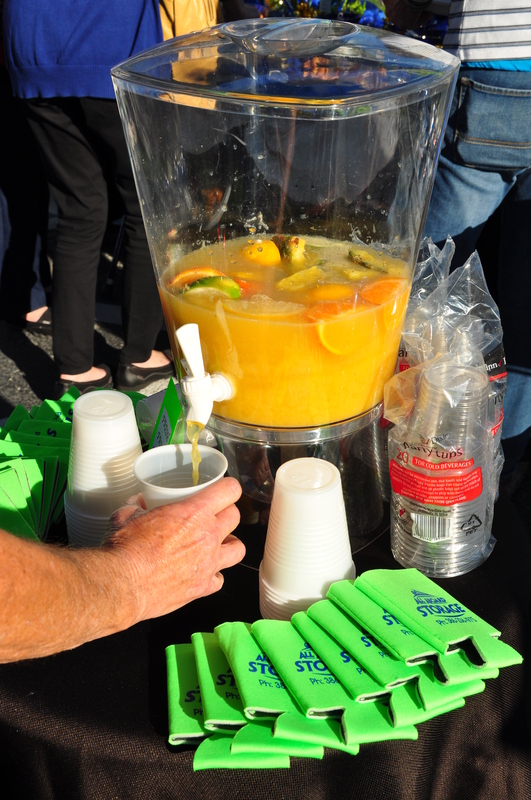 Perrott beverage distribution facility in Ormond Beach, which will soon be a local All Aboard Storage facility. 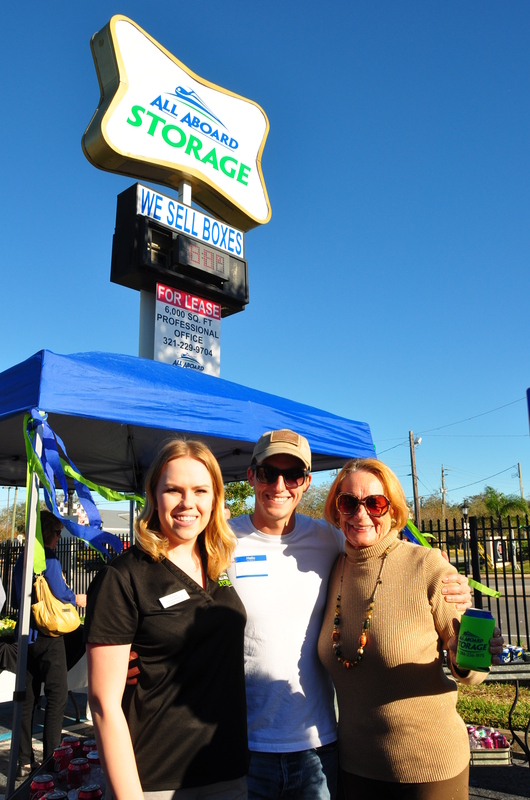 How did your family get into the self-storage business? 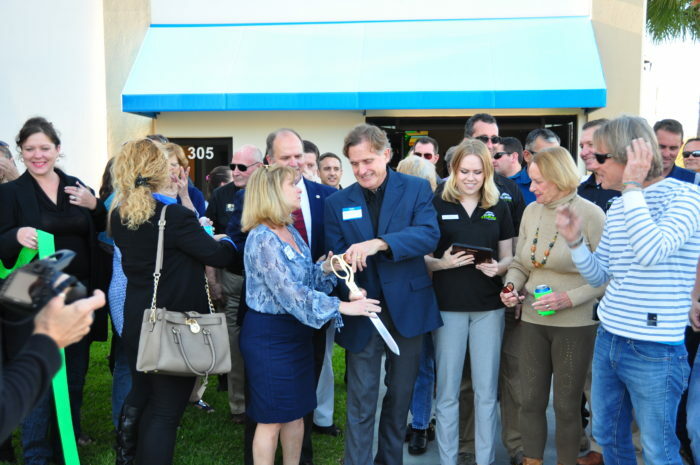 With 15 facilities, are you the dominant self-storage company in Volusia County? 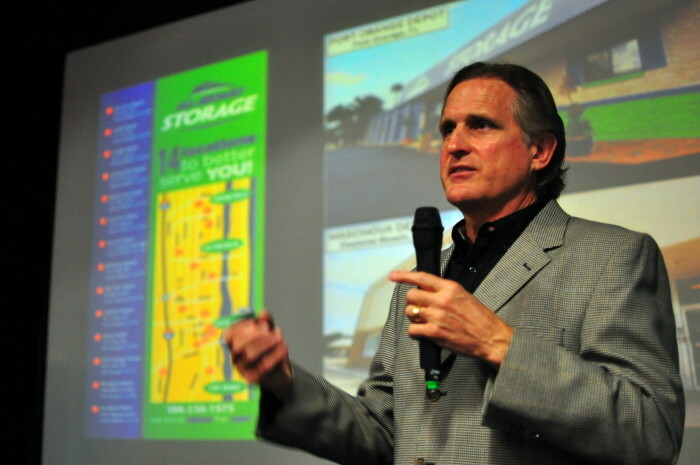 Is the self-storage industry closely tied to the home real estate market? Have you seen demand rise locally? Why add another Ormond Beach location? A comparison of the S.R. 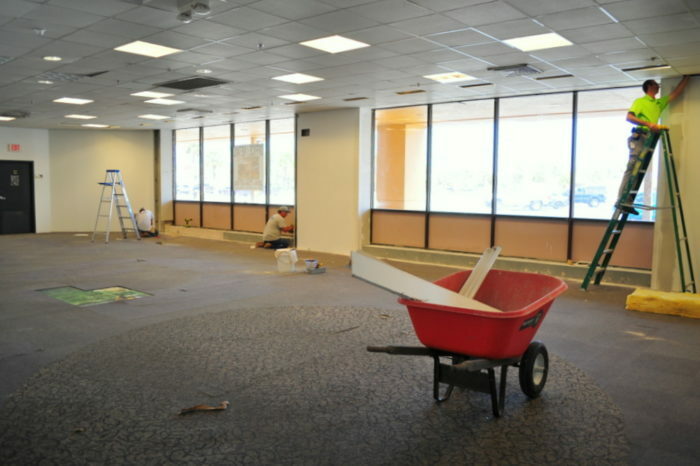 Perrott renovation and the Sunshine Park Mall project. When will storage space at your newest Ormond Beach location be ready to rent? 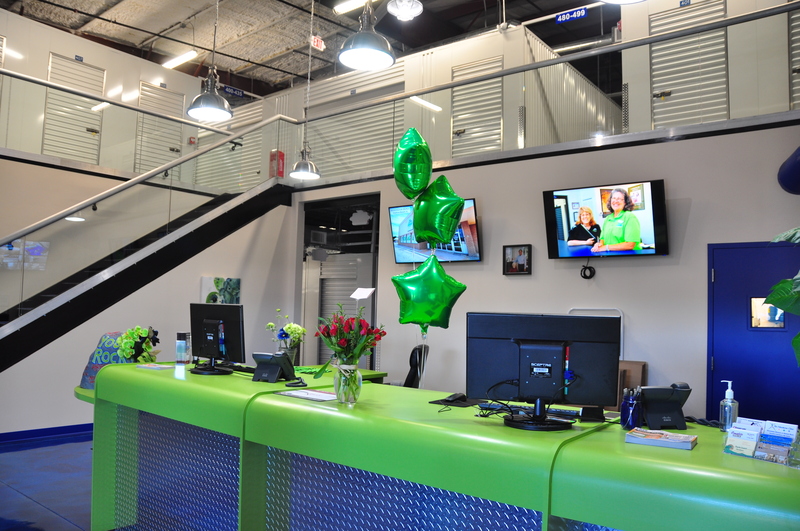 Here at All Aboard Storage, we’re continually improving our processes and making sure our customers are served to the best of our abilities. 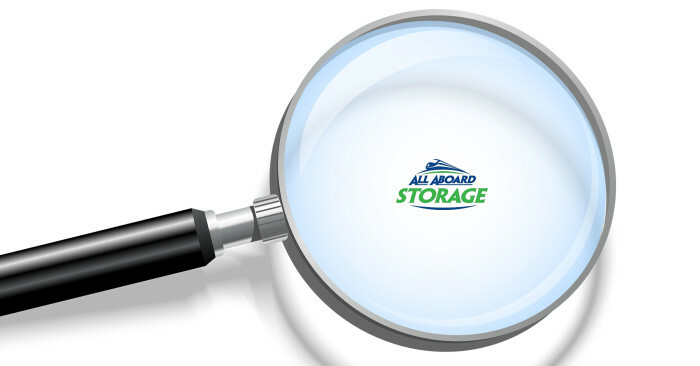 Do a search for a local All Aboard Storage near you and reserve a unit from the comfort of home! 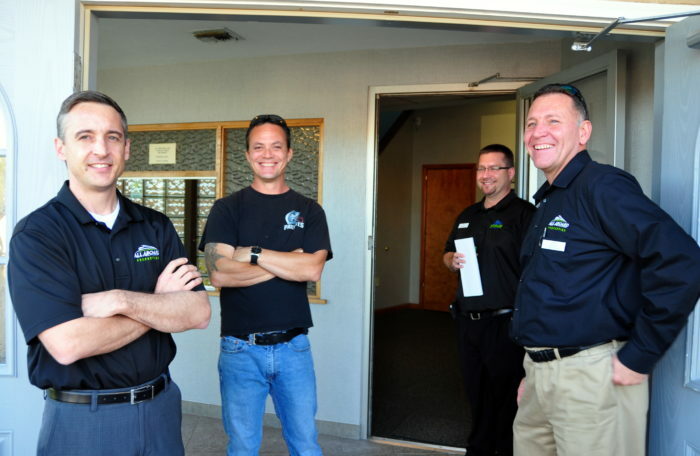 We have future plans for more local storage, but we always keep customer service as the foundation of our company. 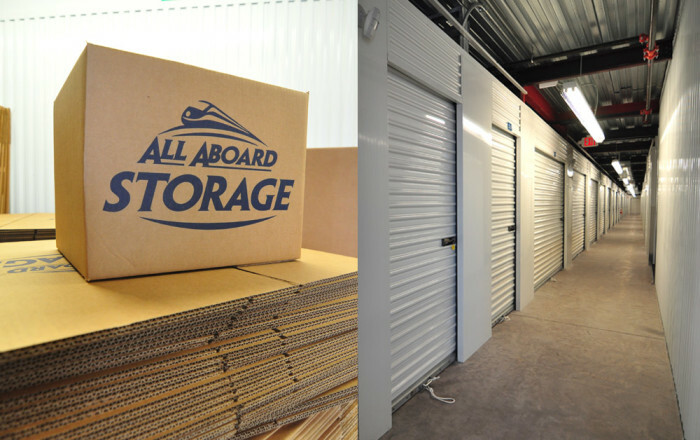 All Aboard Storage – We Have Space for You! All Aboard for Our 2016 Company Cruise! 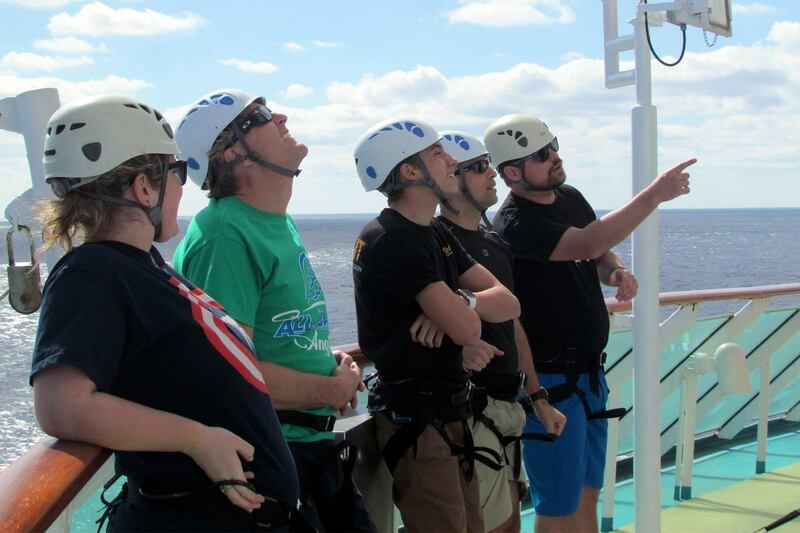 On January 22-25, All Aboard Properties President & CEO Andy Clark took his employees on their fourth annual 3-day cruise to the Bahamas on Royal Caribbean’s Enchantment of the Seas to celebrate attaining their 2015 financial goals. This cruise is our way to encourage teamwork, camaraderie, and as a reward for meeting goals. 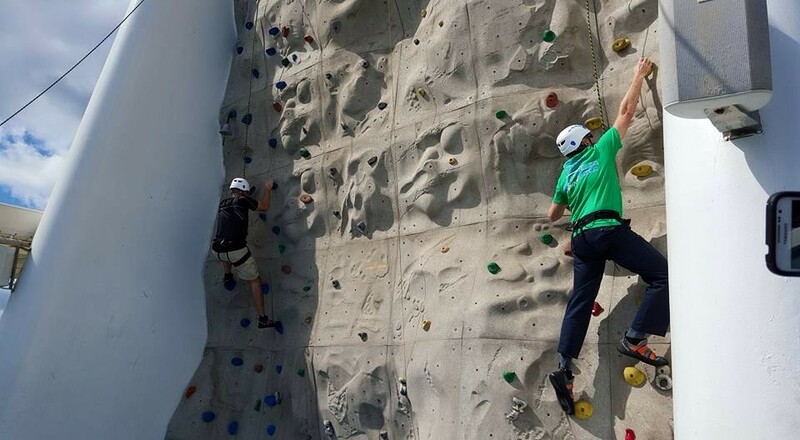 Group activities on the ship included a scavenger hunt as well as a rock wall climbing challenge. 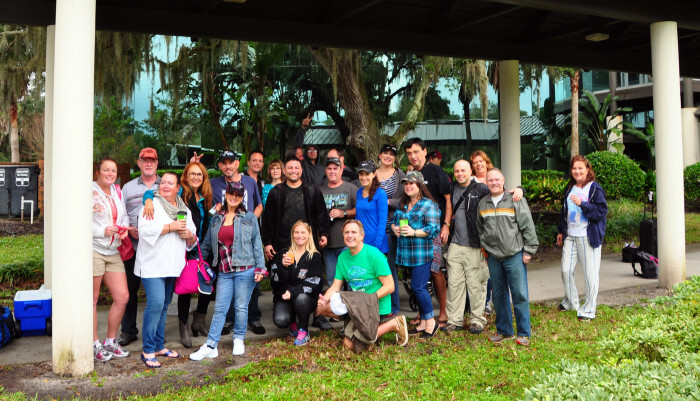 Every employee and a guest is invited and a private bus is rented to shuttle the group to and from our office building to the cruise terminal if our annual revenue goals are reached. 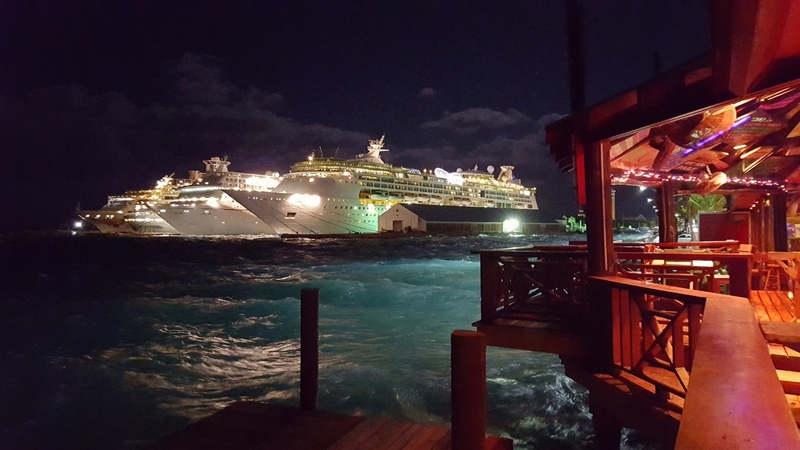 2015 was the 4th year in a row we attained our financial goal and it was our 4th cruise to celebrate this milestone. 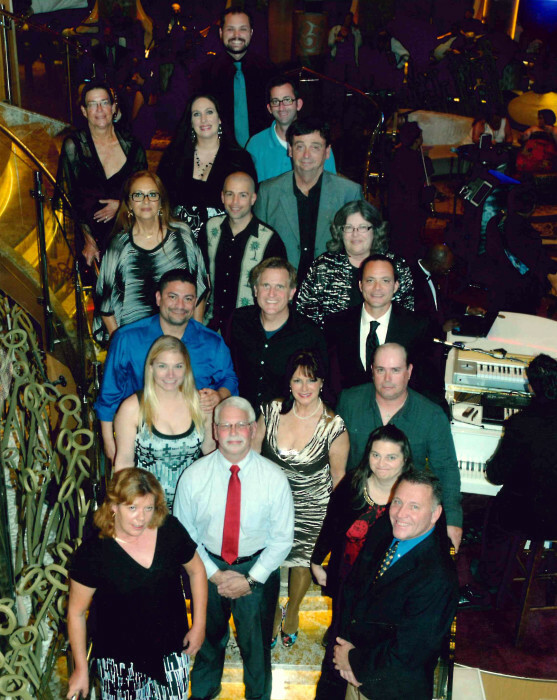 We had a total of 26 of our 38 full-time employees go on the cruise this year. 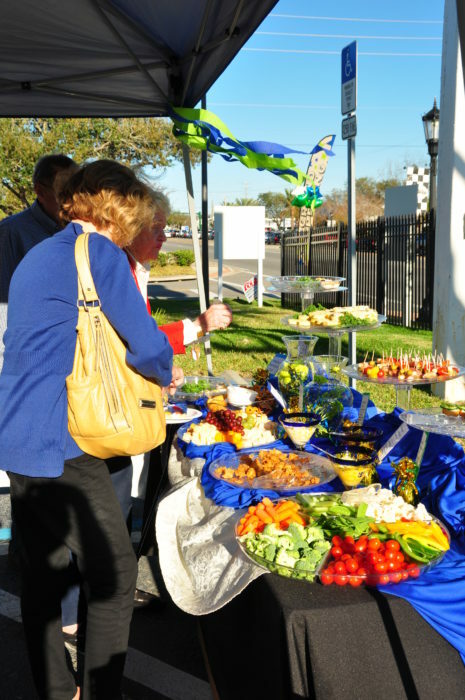 Three employees paid for additional family to attend beyond the one guest paid for by the company. Employees who did not attend stayed behind to work so that some of our 14 self-storage property offices could be open for our customers. Here’s some of the group at the Clark Office Building just before departure. What a lively bunch! 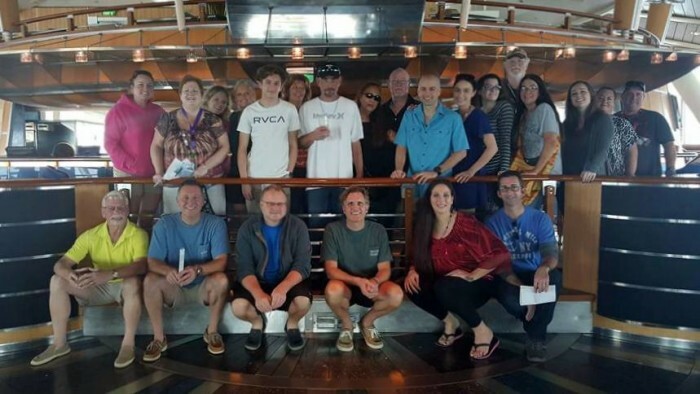 All in all it was a great time with great friends – one more reason that All Aboard Properties & All Aboard Storage are great places to work! Do you have stress in your life? One thing that has shown to help with this is getting rid of excess “stuff” that could be piling on unnecessary stress. If you stop and ask yourself “Why am I keeping this?” it might be because it could be something useful “someday” or maybe it’s sentimental or maybe it’s just something you hadn’t gotten around to. This works wonders when it comes to organizing your life and removing things that you don’t use on a regular basis. If you’re short on space like most of us are, another strategy that works wonders is to rent a storage unit for those “keep” items that you might not use all the time. 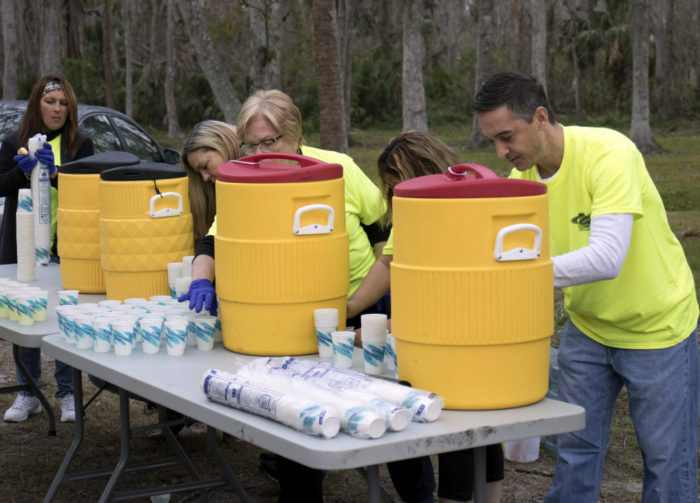 Maybe you want to clean out the garage or that extra room that you want to turn into something fun or useful. We have a large variety of sizes that will fit any person’s need to de-clutter and remove unnecessary stress.